Some time ago, Target started implementing that Target Cartwheel be scanned last, after all other Target coupons & manufacturer’s coupons have been scanned. Since then, I have gotten many comments & e-mails from readers wondering why I calculate my deals the way I do when Cartwheel is scanned last. So I just wanted to take a minute to try and help clear up the confusion. 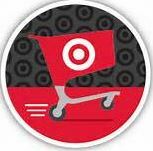 While Target Cartwheel should be scanned last, (in fact- there is now a screen that pops up when a cartwheel bar code is scanned, asking the cashier to confirm that all other coupons have already been scanned) it does not affect how Cartwheel discounts are calculated. So I just wanted to show you an example of how this change in the order of cartwheel being scanned has absolutely no effect on how the discount is calculated. It remains the same as when Target first implemented Cartwheel. 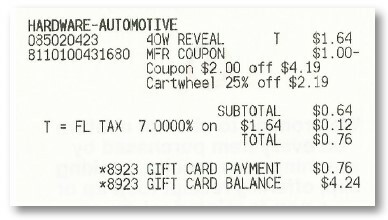 A Cartwheel percentage is always calculated AFTER a Target Coupon, and BEFORE a manufacturer’s coupon no matter when it is scanned. So here’s an example for you. I purchased a 4-pack of GE Reveal Light Bulbs for $4.19. I hand over a $2.00 Off Target Coupon, bringing the light bulbs down to $2.19. Next I hand my $1/1 Manufacturer’s Coupon for GE Light Bulbs over. And the very last thing I hand over is my Target Cartwheel Barcode and as you can see- it has deducted 25% Off $2.19 which is = to .55 cents (item cost minus Target Coupon), making my total before tax .64 cents. Had the deduction been taken after both coupons, I would have only gotten .30 cents for cartwheel and my total would have been .89 cents before tax. So even though Target stores are asking that Cartwheel be scanned last- no worries! You are still getting the full discount the same as it always was- which is a deduction based on a percentage of the item’s cost minus any Target Coupon used. I hope this helps clear the confusion up a bit. For more information on how Cartwheel works, you can check out my post HERE to help get you started. If you are interested in doing the GE Reveal Light Bulb deal- all these coupons are still available and you can check out that post HERE. I think that Target asking the cashiers to scan Cartwheel last stemmed from the issues they were having from registers freezing, etc when the cashiers scanned Cartwheel first, then coupons. I’ve had the register freeze twice after the cashier scanned my cartwheel barcode. The second time I had over $150 in groceries and I had to un-bag everything and put it back on the cart. Hopefully they can fix the computer malfunction soon. I love cartwheel! I agree, Amanda. Last night I forgot to give them my paper coupons until after the Cartwheel was taken off. As soon as the first paper coupon was scanned – the register froze. I also had to un-bag everything and start over :). The checkers were very nice about it. I pretty much blamed it on myself since I knew better :). so if they scan cartwheel after all other coups we dont save as much so can we have them scan the cartwheel first? I forgot to use my cartwheel with yesterday’s purchase.Can they refund me the difference like when I forget my coupons? It’s around $4, so it would be nice to get that back. I don’t see any wording on the app about what happens if you forget to use cartwheel. TIA!! Even if you have them scan the cartwheel first it will take off the percentage after the target coupon. I’ve tried it. @ Naomi-You can always ask at guest services. When Cartwheel first came out I kept forgetting to have them scan my barcode for it so I went to guest services. It was a bit of a pain because they didn’t have a procedure in place like they do with “missed coupons”, so they just manually calculated how much Cartwheel should have saved me and “refunded” me that amount. I work for target. The reason they have you scan it last so it won’t freeze the computer. Also if you forget to scan your cartwheel, the g/s team member can do a fix a mistake, wrong payment, and it will take them back into your transaction. You will have to go through your payment process again but then it does ensure you get all your discounts. Oh wow. One time I forgot to get my cartwheel scanned. I did inquire about if they reimburse me the money and they told me no. Might be some stores? I was at Target yesterday and because I had frustrating issues with the coupons, I forgot all about the Cartwheel. When I got to my car I had realized my mistake and went to return one of the items (the GE Reveal light bulbs). The Guest Services was able to use my Cartwheel and refund me the difference. It took a while because they had to do 5 individual transactions but I got my savings. Also, every once in a while the Cartwheel app does not discount the percentage. Not sure why they don’t work all the time even though you buy the EXACT item but management has just come over and manually entered the percentage off for me. A few times the clerk at the register would scan my cartwheel first, my target coupons would not always work then. For example, if I had a $5 off a $20 mens clothing Target coupon and cartwheel is scanned first, then the register did not accept my coupon. There would be a few items in my cartwheel that would apply to that coupon so the percentage discount would be taken off for Cartwheel, so then I did not have a $20 purchase for the $5 coupon to be taken. So, be sure to check your receipts. I was able to go to guest services for this and was reimbursed the coupon amount, however I do still find that some clerks are confused on Cartwheel and that you are still able to use Target and Manufacturer coupons in addition to the savings. It does state that on the site so I always show them that. Bottom line I ALWAYS scan cartwheel last! @Christina – I think you need to re-read the post. Kerry is showing that it doesn’t matter that they scan it last, you will still save the same as if they scanned it first. I know at my Target they will only scan the cartwheel last, and it ALWAYS takes off the correct % off the item. The % is ALWAYS calculated AFTER deducting Target coupons and BEFORE deducting Manufacturer coupons). Cartwheel must be scanned last due to the computers freezing if any other coupons are scanned after cartwheel. I have a question. I know cartwheel can be used for four items in a single transaction. But if I use it on. 1 item in the first transaction, will it work on the same item if I buy next day in a separate shopping trip? Hi Misty- yes it will. Thanks Kerry, you are awesome. Though my friend referred to your website long back, I was always scared to shop at target with so many complicated ways to shop like MQ, TQ, mobile coupons, shopkick coupons and cartwheel. I would sure forget one and won’t have time to deal with customer service. But now, I think I am gettingg a hang of it. Thanks for all your efforts to save us money and time. And yes, the 10 scenarios for 10 off 50 coupons iOS just ….. (Marvelous). In fact I have no words to express how impressed I was. Thanks again. Anybody have trouble with just scanning the Cartwheel barcode? It happened the last 2 times, the cashier had to manually enter the code. @AJ My printed barcodes NEVER scan. I do not have a mobile device so the only way I can get Cartwheel savings is from the printed barcode. I just (nicely) ask the clerk to manually enter the numbers under the barcode and it works! So far, no problems except that extra step for the clerk. I haven’t had any trouble with them being able to scan my cartwheel barcode but if you ever have trouble switching between all the different discounts on your phone (i.e., shopkick, mobile coupons, cartwheel, paying with e-gift card…and the data connection seems to be taking forever). There are a few tips to make it faster for you. If you have an android device, there is an option to put a Cartwheel widget on your screen. This contains your barcode so you don’t have to open the Cartwheel app and switch to “My Cartwheel” screen. It saves me time when I am using all the different discount options (you also don’t have to worry about data connection). Another timesaver is to sign up for/view your mobile coupons through the Target mobile app. (Menu–>Deal & Coupons–>Mobile Coupons). It shows all of your mobile coupons in one spot so you don’t forget what is on them and you don’t have to pull up all your different text messages at the register. If you don’t already have the Target Mobile app, I strongly recommend you download it. If you are ever in search of something, just type it in (or scan a barcode if one is available) and it tells you where to find the item (which aisle) and if the item is in stock (uses GPS to determine which store you are at). Saves time not having to wander about looking for something. Thanks for explaining this! I know this is the busy holiday season, but maybe sometime in the new year you could post a tutorial on how to read a Target receipt? I always figure up (roughly) how much my shopping trip is going to cost before I pay, so I know that 99% of the time I am paying the correct amount, but I still cannot figure out how it got there from that confusing receipt!!!! Thanks for posting this after my post. I see what you are saying on your receipt. Now, I still think that there is a problem, tho. Of course, its always a bonus if your Target coupons don’t attach to the item and you get the % off on the full price! I adjusted the Brightness setting on my phone to as bright as it gets, and my barcode was then able to be scanned. @Denise h…thanks for the tip about mobile coupons in the app. However, i am signed up for them and they only have one set stored in there even though I have multiple links for different mobile coupons. Is there a way to see them all?! Yes I agree that the target registers have issues. I shop ALOT at target. I will say that the registers hAve gotten much better at recognizing target coupons. I hAd the same issue with cartwheel freezing the register, so I know better. What I will say, that is a huge concern for me…. I have noticed in the last yeAr 1) that coupons are attaching to the incorrect items on the receipt and 2) that certain items are listed in the wrong category on a receipt. This happened to me yesterday but also on a majority of my trips. Both of these could case you to potentially save less than you expected. I have calculated mine yet, but this is a real issue. that’s funny. I was just at Target this weekend and the cashier INSISTED she scan cartwheel first lol! I take a screen pic of the coupons, cartwheel, and gift cards. When I get to the register, I hand all the paper coupons, then swipe each saved pic on my phone. Thanks to a reader’s tip. Hi, it has to do with the Target system and crashing if it is not used last. thank you for the clarification. I really appreciate you being so diligent and patient with us all. I often thought about why they asked me to scan it last. but never asked why. thanks again! Hi! I recently stumbled upon your blog and appreciate your dedication and knowledge! I know this is an older post but I just started couponing and I’m wondering about “category coupon”, that is obviously a Target coupon but is that applied first?? I.e. 25% off beauty/personal items, This recent sale they had, I wasn’t sure if it (25%) was applied before the target coupon of let’s say $1 off. I bought toothpaste at $5.99 with 25% off category coupon, $1 to, 2$ mq, and 10% cw. Is this the correct order of deduction below? ?